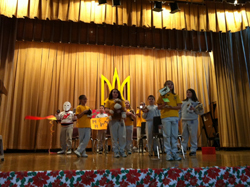 Today, the Fourth grade class performed the 12 Days of Christmas in New Jersey. Keeping up with the Social Studies curriculum, they read interesting facts about the history of New Jersey, from it's involvement in the Revolutionary war and pirates, to the five light houses that keep our shore safe for ships. They sang about horses that are bred and raced in New Jersey, dogs that are trained to help the blind, as well as the state bird and state tree; the goldfinch and red oak. 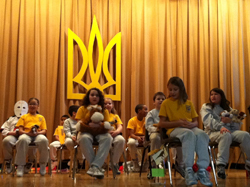 Students howled like the wolves that live on the Lakota wolf reserve and read about the Jersey Devil. 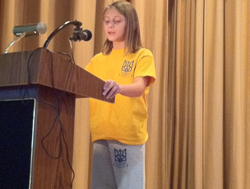 They read about Thomas Edison and his inventions and the best blueberry pie in New Jersey's diners. I bet they will even try to find Captain Kidd's treasure this summer. What a fun way to learn about the state the students live in.